James, from Birmingham and Laura, from Wicklow, met in California in the summer of 2008, where Laura was on her J1 and James was on holiday with his brother and a friend. They crossed paths at a BBQ in a hostel off Hollywood Boulevard, and thus began their 'Hollywood romance'. James popped the question to Laura on a run-of-the-mill Monday in their kitchen. Laura had spent the day in work while he stayed at home painting the house, and on her return she breezed through the house asking if dinner was ready before heading upstairs to change into her sweats. Laura returned downstairs to discover James on one knee, with 'Will you Marry Me?' scrawled in paint on the wall. 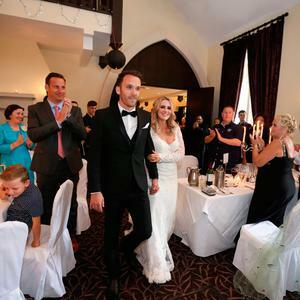 The couple tied the knot in Avoca Church in Wicklow, before a reception in the Brooklodge Hotel at Macreddin Village. The focus for the day for them was to bring as many of their friends and family together to celebrate with an Irish wedding, which they had some fun with by centering it on a Hollywood movie theme. Their photos are by Will O'Reilly. Laura jokes that theirs was always going to be an 'Irish' wedding, saying it was never up for discussion to have it anywhere else. 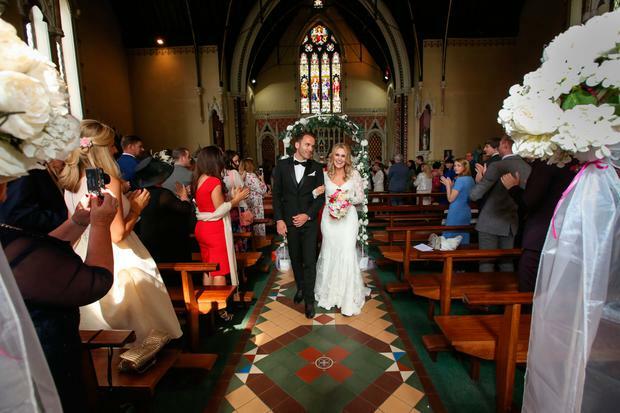 Being from Wicklow, the choice of Avoca Church was an easy one for the bride, and it was there the couple exchanged vows before their reception in Brooklodge. 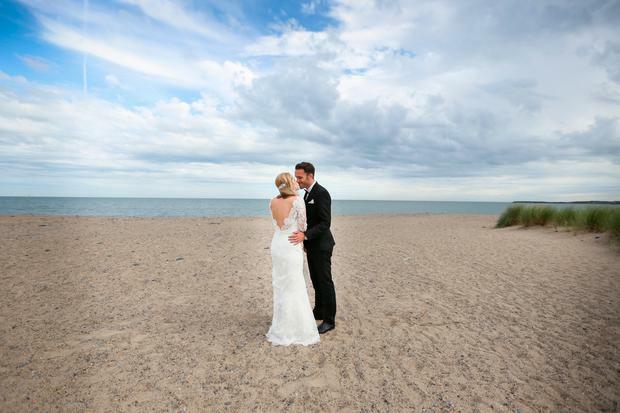 "There were elements that I loved about planning the wedding; the dresses, food and entertainment were definitely all things I wanted to get right," says Laura. James designed their invites to look like cinema tickets, thus setting the theme, and little touches such as the bridesmaids in red, Laura's 'blue suede shoes' and their US style canapés of cookies and milk, mini hot dogs, and individual portions of mac and cheese carried their Hollywood theme throughout the day. 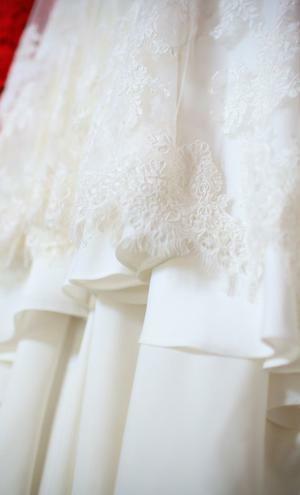 Laura admits she must have tried on about fifty dresses before finding the one; "As I was an August bride, every consultant in every shop pulled out strapless dress after strapless dress and I was pretty non plussed." She tried dresses on everywhere from Birmingham to London and back to Dublin and just wasn’t finding one that felt right. Eventually however she found three dresses in a boutique in the UK that she loved, "but in the end there was only one that I kept coming back to." 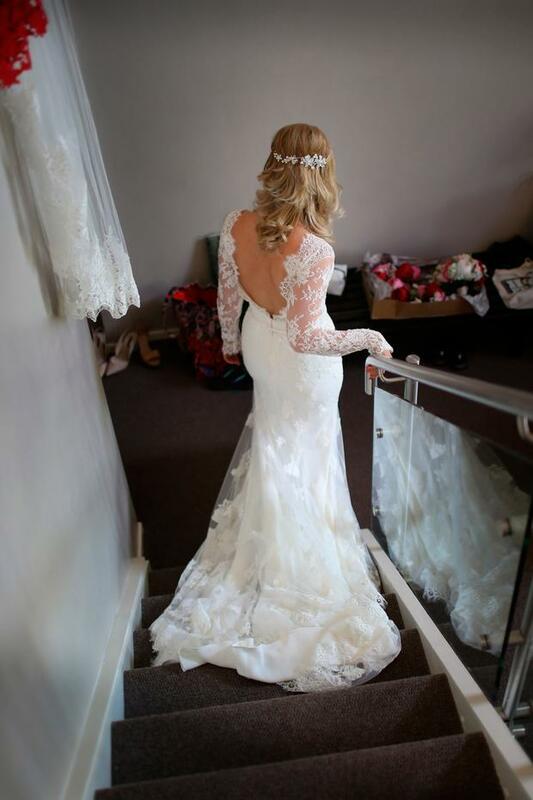 "My last remaining grandparent, my grandmother Pat had passed away the month before I had chosen my dress and she had set aside some money for me to have which my dad suggested I put towards my dress," Laura explains. "Granny Pat was born and raised in Melbourne, so when I saw the label “Essence of Australia” on the dress, I took it as a sign. She would have loved it." Laura's red bridesmaids' dresses were inspired by the popular styles of designer label Self Portrait, and she had all four made from scratch by a dressmaker for under €250. 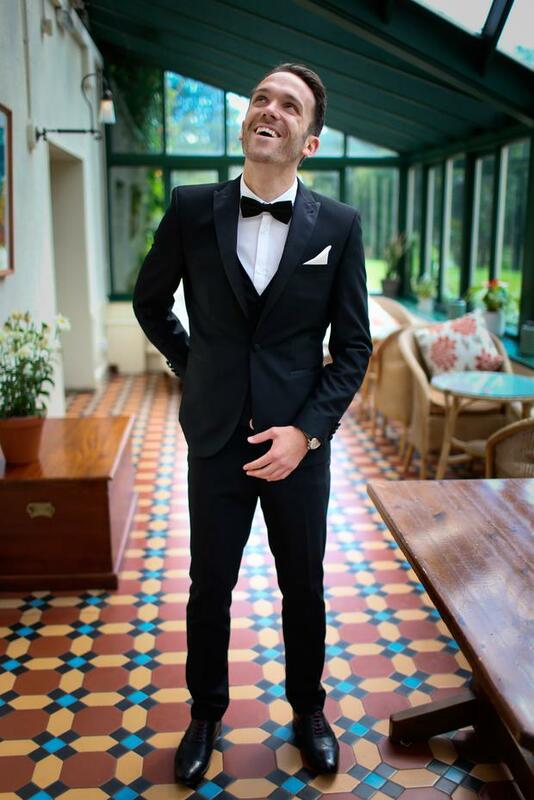 For the groom's suit she says; "James is a big fan of Next for his suits as the tailoring suits him, so he was lucky he found a very smart black tux that I approved of in there!" 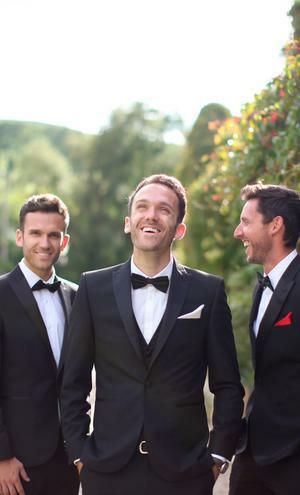 The couple held their reception in the nearby Brooklodge Hotel and Macreddin Village. "Brooklodge was somewhere we had gone for lunch with my family on occasion when he came with me to visit," Laura says. "It was always so pretty and when I called them the date of our anniversary was free. And it was a Saturday in summer! I took that as a sign and that was it! Oh and the food is unbelievably delish there – a must!" 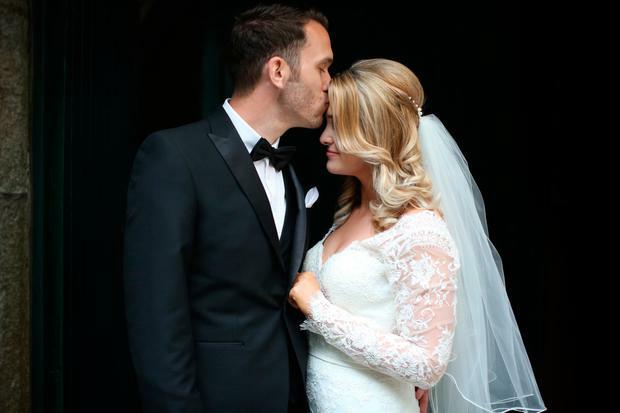 Laura and James opted to bring their US/Hollywood theme to their reception through their food choices, and so they served American themed canapés throughout their drinks reception. For evening food they served pizza, and wedding cake - made by Dainty Bakery in Arklow. "They have done every cake at every milestone in my life since my baptism and they are just my favourite," says Laura. "James making a speech was really special," says Laura of her most memorable moments of the day, "he isn't one for public speaking and him getting up and showing he is more than capable of holding his own was amazing for me to see. That was the bit he always said he dreaded." 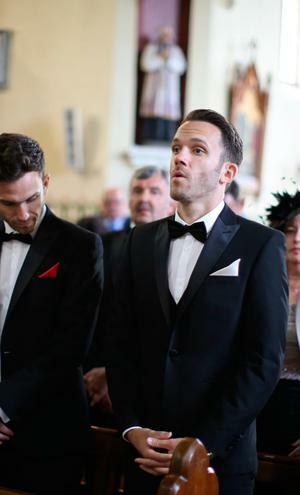 Another stand-out moment for the couple was their 'first look' before the church - "we got our nerves and tears out of the way before the ceremony so by the time we got to the church, we were both just beaming with excitement." 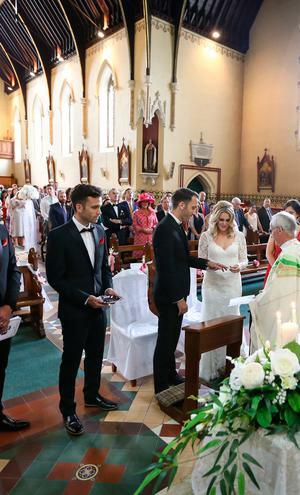 The couple tied the knot in a traditional Catholic ceremony in Avoca Church. " Their priest, Fr Alex, is a family friend from years back, and Laura asked him to officiate the day. 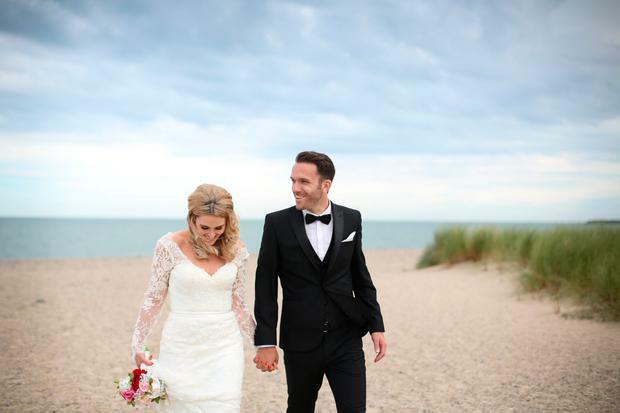 "He is a lot of fun and it certainly wasn’t a long overblown traditional ceremony," she says, "all the music was from movie soundtracks and my music teacher growing up - Niamh Penston - put together an incredible musical ensemble. Her voice is just incredible and made the day even more special." "The only thing I would say," says Laura, "is don’t forget why someone wants to marry you and do your best not to lose sight of that. Stay true to who you are as a person and not just a bride. Remember that the marriage is the exciting part, the wedding day itself is only the beginning!" For their honeymoon, Laura and James went on an epic tour of the US. They first went to Chicago for three nights, followed by a week in Maui. They then moved on to San Francisco for three nights and followed that with a road trip down the Californian coast taking in Cambria, Big Sur, Monterey, San Luis Opisbo, Pismo Beach, Santa Barbara. Finally they spent five nights in Los Angeles. "It was a complete dream and we go back to each and every place again," says Laura. "Griffith Park in LA was our favourite spot for a morning hike with incredible views of the city."